The capital of Normandy, Rouen is just a bit over an hour's train ride from Paris. If you've only got a day and you're intent on doing the "if it's Tuesday it must be Paris" shtick by heading off to the big city on your own, we won't dissuade you -- particularly if you've not been there before. 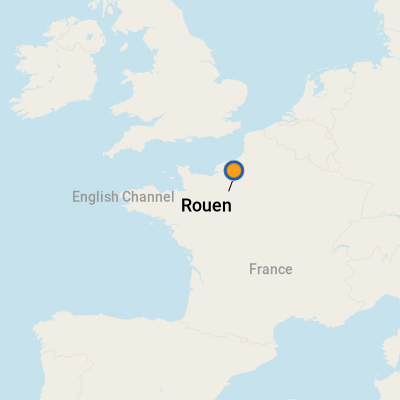 But Rouen's worth a look, too. With 2,000 years of history, it is one of the country's most ancient cities, laid out by the Duke of Normandy in 911. Victor Hugo called Rouen "the city of a hundred spires." Like Paris, the city is divided by the Seine, and like Paris, Rouennais refer to the sides as Rive Gauche (Left Bank) and Rive Droite (Right Bank). The Old City is on the Right Bank. Chock-a-block with cobbled streets dotted with French Norman architecture dating back to the Middle Ages, it is where you'll see the gothic Notre-Dame Cathedral and swear you've spied Monet painting a cityscape across the way, as he did. Visit the thyme-covered mound in the square where Joan of Arc burned at the stake (place du Vieux-Marche) in 1431 while the English had control of Rouen from 1431 - 1449. Over the centuries, great devastation came to Rouen -- including 45 major fires in the first half of the 13th century. WWII destroyed all its bridges, many of its spires, and much of the area between the cathedral and the quais -- resulting in the city being almost entirely rebuilt in the years since the end of the war. Rouen is also a terrific jumping-off point for other great haunts in Normandy -- marvelous places like Giverny (31 miles/50km), Honfleur (44 miles/72km) and Dieppe (36 miles/58km). And we can't say enough about the entire region being a spread-out bonanza of creamy Camembert, velvety omelets, oysters so fresh you'll think they jumped from the sea unto your plate and Bon Bere (cider) in provincial cafes anywhere you go. Port Rouen. There's plenty to see and do if you want to spend the day in the area and everything you need is close at hand. The terminal offers telephones, a small coffee shop and currency exchange. Taxis are readily available outside the entrance to take you to the city's center (a ten-minute ride or 25-minute walk). A good first stop if you're staying in Rouen is its tourist office (25, place de la Cathedrale; +33 (0)2 32 08 32 40), open May - September: Monday - Saturday, 9 a. m. - 7 p.m., and Sunday, 9:30 a.m. - 12:30 p.m. & 2 p.m. - 6 p.m.; October - April: Monday - Saturday, 9 a.m. - 6 p.m., and Sunday, 10 a.m. - 1 p.m.). Inside, you'll find lots of guide books and you can sign up for a two-hour guided city tour every day at 2:30 p.m. There's an additional tour at 5 p.m. on Saturday that covers the Jewish quarter. Cars here mostly use diesel, not unleaded gas. We're sorry to say rental agencies don't point this out, so check. A mistake will cost you lost time and almost $300 in repairs. The Metrobus system winds through the city of Rouen via buses and light rails. There are always plenty of taxis. Bicycles can be borrowed through the city-wide shared cycle service of 14 stations and 175 bikes, Cy'clic. Paris from Rouen: It is 84 miles/135km (about 1 1/4 hours) via train Paris. Trains to and from Paris/Rouen run frequently and reservations aren't required. The first train from Rive Droite Station on rue Jeanne-d'Arc to St. Lazare in Paris is usually just before 6 a.m. The last train out of Paris is close to 9 p.m.
For exploring Normandy beyond Rouen, it is best that you rent a car. A good bet is a local company, Argus Rentals, located both in town and at the airport. (00 1 (213) 210 2427) Count on approximately $70 (58 euros) for a one-day economy-car rental. Major brands such as Hertz and Avis are in Rouen, but can cost twice as much as Argus. There are buses to and from Rouen to other towns like Honfleur and Deauville. The Boos Airport offers connections within France and other European destinations (and the States) via Le Havre or Lyon airports with Air France and various charter companies. The airport is located about 5.5 miles/9km from the center of the city and easily accessible from in and out of the town's center and port by shuttle buses (to and from the SNCF station) or by taxi. The national currency in France is the Euro. Currency exchange can be made in most banks, post offices and train stations. For the best exchange rate, use ATMs found almost everywhere. For up-to-date information on currency exchange, go to www.oanda.com). In France, a 19.6 percent sales tax (VAT) is tacked on to many purchases -- however, if you spend $175 (145 euros) or more at any one participating store, you can get the VAT refunded (with some exceptions). .
French, though English is understood here and there. It's not uncommon to find that more than most waiters, shopkeepers and taxi drivers don't speak English. And to complicate things for those already fluency-challenged -- there's a dialect in Normandy that can be difficult to decipher, even when you consider yourself moderately fluent in French. It's considered impolite by the French to assume everyone speaks English -- so it's best to begin by first asking if English is understood. The gesture is appreciated. Monsieur, madame or mademoiselle (for young girls) should follow bonjour. Merci should always precede a departure from any shop, whether you were helped or not. Besides, it's so much fun to say. Keep in mind that restaurants are closed for anywhere from two to four weeks during August, so it's best to check ahead.